Millions of Kenyans are suffering from the deadly disease cancer. 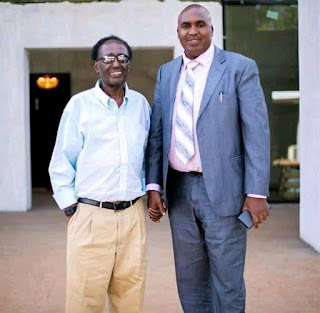 Among those who have been battling this Killer disease is flamboyant city business man chris kirubi.
. The business man is now recovering but still fighting this killer disease. Here is what he shared on his social media handles, during this cancer awareness week. 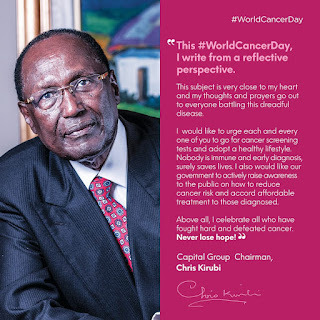 "This #WorldCancerDay, I write from a reflective perspective. This subject is very close to my heart and my thoughts and prayers go out to everyone battling this dreadful disease. I would like to urge each and every one of you to go for cancer screening tests and adopt a healthy lifestyle. Nobody is immune and early diagnosis, surely saves lives. I also would like our government to actively raise awareness to the public on how to reduce cancer risk and accord affordable treatment to those diagnosed. We wish him quick recovery.